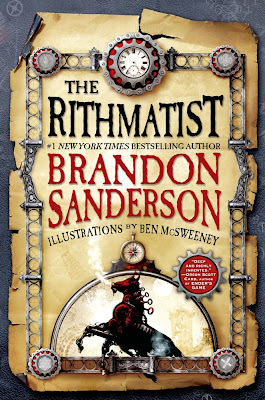 The Rithmatist (published May 14, 2013 via Tor Teen) is a new YA fantasy with a steampunk flavor by Brandon Sanderson, and it's utterly engrossing. Because it's a Sanderson book, I feel like it almost doesn't even bear mentioning any more that there's an inventive new magic system with well-defined rules. There are also drawings and diagrams between each chapter, presumably our protagonist Joel's notes to himself. While reading them in-depth isn't necessary to understand the plot, they definitely added to the mood of the book. Although Sanderson's magic system has clear rules, he doesn't let those limit the story, and he stretches and breaks them when necessary. I appreciated that intuitive and clinically scientific approaches to the magic were both completely valid. The premise of The Rithmatist felt in a lot of ways like a reaction to his Alcatraz series, where one character knows everything about magic use but can't do anything about the fact that she was born unable to use it. This book plays with the same idea—wanting something so badly and putting in all the effort in the world and yet still lacking the talent—but takes it in a different direction. I can't wait to see how he explores this. Sanderson nailed the tone of how teenagers think and behave. Our protagonist Joel is absolutely brilliant—so brilliant, in fact, that he has difficulty doing the work and has nearly flunked out more than once. Joel's approach to school, and life, really rang true, and he's a different kind of protagonist than I'm used to reading. Within the school setting, there were also some interesting thoughts on bullying, talent, class interactions, and the purpose and value of education. The school administrator was actually one of my favorite characters. I have to say that I never really had a clear sense of the setting. The story mentions a place called “Georgiabama” (really), and there's a lot of states that are similar to our world yet not quite exact (“Maineford,” “Nebrask,” etc. ), almost like an exercise in creating place names. There's also apparently a giant Korean empire, which is cool, but I really would have liked a) a map and b) a little more historical background on how our characters' world came to be. I did like a lot of the intercultural elements, like Joel's observations on “authentic” Italian food or the normality of eating a ham and kimchi sandwich. We get a lot of clues about the world through what Joel eats and reads. The ending felt kind of abrupt, but I actually liked it; the story stopped in exactly the right place. There's no denouement, really; it pretty much ends with an action scene. I appreciated that the story about the legendary duel from the very beginning came full circle at the end. Brandon Sanderson wrapped up the plot of The Rithmatist, but still left plenty for a second book to deal with. I can't find anything conclusive about a sequel, but I am hopeful. NOTE: The Hardcover edition features a map which will be helpful to all readers. I thought the ending was sharp too and would have liked a smoother landing. Still, I thoroughly enjoyed "The Rithmatist" and appreciate the insight into the teenage mind.